Eric Morecambe and Ernie Wise (the 'heroes') appeared in a comedy film, The Magnificent Two, in 1967. Our 'heroes' are salesmen selling model soldiers in South America and they get caught up in a revolution and Eric is a look-a-like for a deceased dictator and Eric is substituted for him. 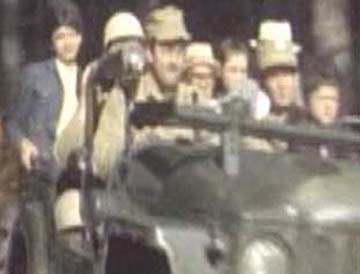 (below)A Vickers machine gun mounted on a pole in the back. The ammo belt looks to have rounds in it but I thought the gun fed from the left? 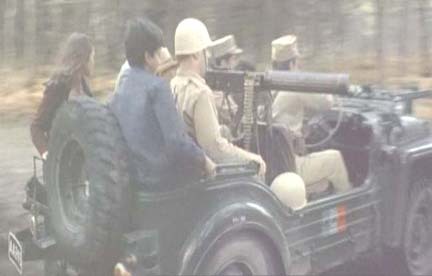 The normal Austin Champ machine gun mount is a pole through a hole in the scuttle so the front passenger can fire it. It is believed a machine gun was mounted in service in the centre back but there are no photos of it. 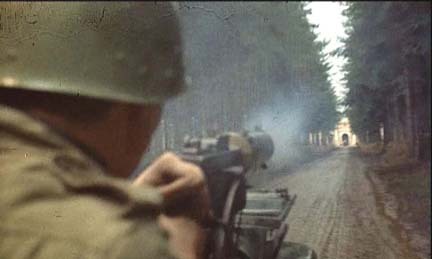 (below) OK, who's volunteering to drive with a Vickers gun firing a few inches from your right ear?, see next two photos. The Vickers in the second photo is just below the white helmet. (below) A platoon of friendlies attacking a defended position - can't say it's the best cammo I have ever seen but they did succeed, they could be from Support Company. In the photo they don't appear to be moving very quickly but the last photo shows they are moving faster than they appear.